The best thing about the Rho hotel is the location, which is just off Dam Square in the centre of Amsterdam, but although it's in the centre, it's not noisy at all. It's tucked away up a side street and is very close to the 5* Krasnapolsky hotel. We have stayed here 4 times and would have no hesitation in recommending it. If you're arriving in Amsterdam via train, it's just a short walk from Central Station, so you won't need a taxi unless you've got heavy suitcases. The rooms are basic, but adequate. Breakfast is the usual continental breakfast, nothing special, but acceptable. Before arrival told check in would be after 2pm but we could leave our cases in a secure room, arrived at 10am and asked if we could leave our cases, reception informed us our room was ready and let us check in straight away. Breakfast was very good and hotel staff efficient and polite. 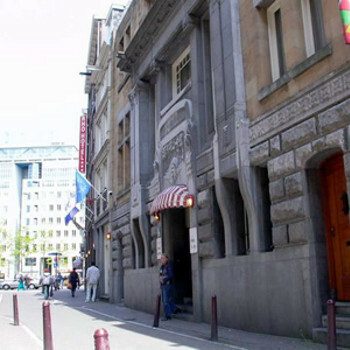 This hotel is situated a stones throw from Dam square and a 1 minute walk to all bars, cafes, red light district etc. The art deco foyer of this converted theatre is stunning, although it is not carried on in the rooms, which are spacious & spotless. Breakfast is the usual dutch buffet affair, and we found the staff very helpful. The hotel is in a little side street, just off Dam, so it's perfectly placed for most things. This hotel is perfectly situated off Dam square. it is close to all the trams, redlight district, coffee shops... perfect! It is actually and old theatre, which looks absolutely stunning as you enter the hotel itself. Huge red ceilings and walls. 1st impression will be very good. Rooms are spacious and clean but basic. This will be my 4th year this year, so that shows that this hotel has everything to offer for a weekend or as a full holiday.